The cause of the fire is still unknown, but prima facie, a short circuit seems to have led to the accident. An investigation is underway to ascertain the same. 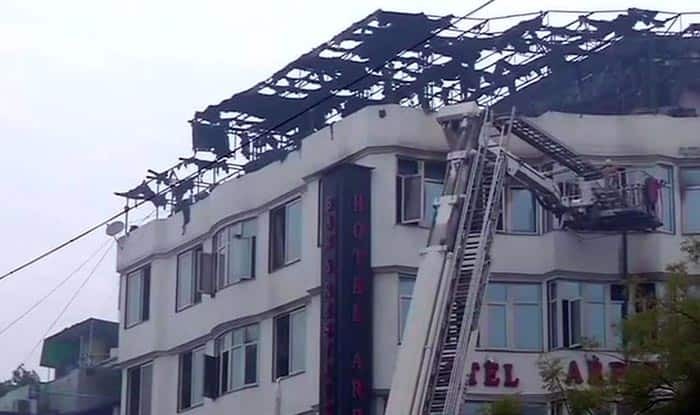 New Delhi: At least 17 people have died in the fire that broke out in Hotel Arpit Palace in Delhi’s Karol Bagh in the wee hours of Tuesday. According to the fire services department, nine people have also been injured. Reportedly, there were sixty people in the hotel when the fire broke out. Nearly 30 fire tenders were rushed to the spot to control the raging blaze. Delhi CM Arvind Kejriwal announced an ex-gratia of Rs 5 lakh each to the kin of the deceased. Fire officer Vipin Kental said that people were unable to use the corridors for evacuation since there was wood panelling on the corridor. In fact, two people had jumped off the building in order to save themselves. The cause of the fire is still unknown, but prima facie, a short circuit seems to have led to the accident. An investigation is underway to ascertain the same. Deputy Chief Fire Officer Sunil Choudhary said the fire had been doused and bodies were being taken out. Delhi Minister Satyendra Jain said that most of the people died due to suffocation. Jain said that strict action will be taken against those found guilty of negligence. The District Magistrate has even ordered an inquiry on the same, he added. On the other hand, Delhi Deputy Chief Minister Manish Sisodia ordered the cancellation of the celebration of four years of Aam Aadmi Party (AAP) government which was supposed to be held today evening in wake of the fire at the Delhi hotel. Delhi Hotel Association Vice President, Balan Mani It was due to fire in ducting because of which it had spread to the hotel rooms. All norms were followed here; the license is issued only after inspection. Mishappening can occur in a house as well. On January 30, a fire broke out at a chemical factory in the Okhla industrial area in southeast Delhi, the Delhi Fire Service said. At least 22 fire tenders were pressed into service. On January 12, a major fire broke out in a building at Pragati Vihar’s CGO Complex in the national capital. Fifteen fire tenders were pressed into service. No casualties or injuries were reported. The blaze was reported at Block-14 of the CGO Complex. A short circuit is believed to be the cause of the fire.